Werner's Cairns blog: Alan Jones’ foot in the mouth. Alan Jones’ foot in the mouth. I totally disagree with the appalling comments made by Broadcaster Alan Jones that PM Julia Gillard’s father died of shame because she is telling lies. Yes, she told a big lie by saying, “There will be no carbon tax under a government I lead” and then reneging on it. However, this is no reason for Alan Jones to make such disparaging comments. Julia Gillard is our Prime Minister whether we like her or despise her; she deserves respect. Telling fibs is part of a politician’s work manual, this is nothing surprising. Those denigrating comments will be counter productive and will go against the Liberal Party, who should have censured Jones immediately. Alan Jones apologising is like wanting to unscramble an egg. In other words, if you hit somebody on the head with a cricket bat and then apologise, that will not take the pain away. The old adage: “Make sure your brain is engaged before putting mouth in gear,” is perhaps what Jones should adhere to. The difficulty I had with saying, I’m sorry. When I was ten years old I was given a pocket knife for my birthday – it was the "In thing" in those days. To test the sharpness of this knife I went to a paddock full with fruit trees belonging to an elderly lady, and sliced some bark off one of the trees. I could have done the same on trees belonging to us, but I was smart enough not to use one of our trees as "sharpness tester," simple, because I would have been a suspect with my new knife, and I knew the consequences that would have come my way. I could see that I it was useless to deny the tree-bark-slicing job, there were two witnesses against me, and I pleaded guilty. The Judge (teacher) said to me, I give you two options. "One: You go and seal the wounds of that tree with wax, and then bandage it. Then you go to the old lady and apologise and say SORRY. I’ll give you one day to fix the tree up and one week to see the lady and say SORRY." He continued, "If you have not accomplished these two "assignments," a second option will come into play – I bring the matter to the attention of your parents". In those days parents and teachers were powerful forces, for whom one had great respect. (I wish this would still be the case today). After school that day, I quietly went about my task and fixed up that tree. Then the hardest task, the apology, was in front of me. I made countless attempts to go to the lady and say SORRY, but I got no further than the front door of her house, with my finger bent and ready to knock on the door. But each time, I could not muster the courage to move my hand and knock on the door – and I went away - to try again later. The seven-day deadline was approaching rapidly, and one the seventh day, finally, with a tremendous mental effort I mustered enough courage to knock at the lady’s front door. The lady opened the door (I can still see it today) and I said to her that I damaged one of her trees, that I had fixed it up and that I was SORRY. The lady smiled and said thank you for letting her know and that it was nice of me to say “Sorry.” I left with a good feeling of having done the right thing and as a reward a tremendous weight had come off my shoulders. The moral of this story is: Not only did I learn a valuable lesson, but also, I swore to myself never ever to get myself into a situation when I would be required to say “I’m SORRY.” The lesson was: To think things through, always asking myself would I have to say "I’M SORRY" after saying or doing something. Only after careful weighing out every angle would I do or say something, and this principle is still with me today. How to to make a comment, see annotation. Well done Werner - most unfortunate that Allan Jones chose a few poor words. The focus will be on these - rather than how they came to be said and all the good causes he is helping with all the time. 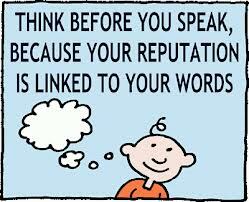 You are correct we are judged by what we say and how we act. Love your quote about keeping your words sweet (in case you have to eat them later). I have also read: "Be nice to people on your way up - as you will meet them on your way down"
I agree with you entirely regarding Alan Jones' comments. He should keep in mind: " Do unto others as you would have others do unto you". More than 40 people were killed the last two weeks and the offending, revolting post could not be cancelled, it multiplied faster than rabbits. Alan Jones comment was way, way over the top. It begs the question since we have no respect for the responsibility that comes with free speech do we deserve to have it and should we put some controls on it? I believe we have to think seriously about this. Without him it will became more difficult to get this government out of power, I wonder if the morally self righteous finger pointers understand that. Alan knows that what he said was wrong, but I feel that in the heat of the moment and the frustration of watching our country going down the gurgler...........well we know the rest. Gillard's Government accountable. We need him and he needs our support. His boss is standing by him. can understand the depth of anger which led to this comment, however, who else has the guts to stand up to members of a Party who have the gall to call themselves Aussies and have destroyed everything that has made our country great. I sincerely hope Alan is able to stay on air, we need all the help we can get to get rid of our present inept government. As for the sponsors - gutless. THE LEMON, WHAT AN AMAZING FRUIT.